There’s a war going on inside my head. It’s an ongoing battle between my inner line cook and inner home cook that’s been raging for quite some time. The home cook in me wants to cook up new dishes all the time, to keep my family interested and engaged, instead of having to endure “Ew Mom, we’re eating mashed potatoes AGAIN? !” But the familiar scenario involves me rushing to get dinner on the table after an afternoon of activities. Everyone’s “hangry.” Fights are breaking out over toys and my role is divided between peacemaker and dinner-maker. 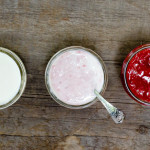 I’m usually reading a recipe for the first time, trying to envision what certain ingredients will taste like and deciding on the fly if the recipe will work as is, or if substitutions would make it better. Blogging necessitates rapid home-cook-style momentum in order to keep coming up with new material. But I also want to make sure readers get well-written recipes, so they too can be successful at dinnertime. 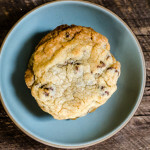 So there’s no greater joy for me than when the two warring sides of my brain call a truce over a truly familiar recipe – either adapted from one of my restaurant jobs or an old family favorite that I’ve been cooking for years. I tend to write these out from memory before cooking, and then make minor adjustments as I go. I feel this way about Chicken Cacciatore, and also about my BLT sandwich. 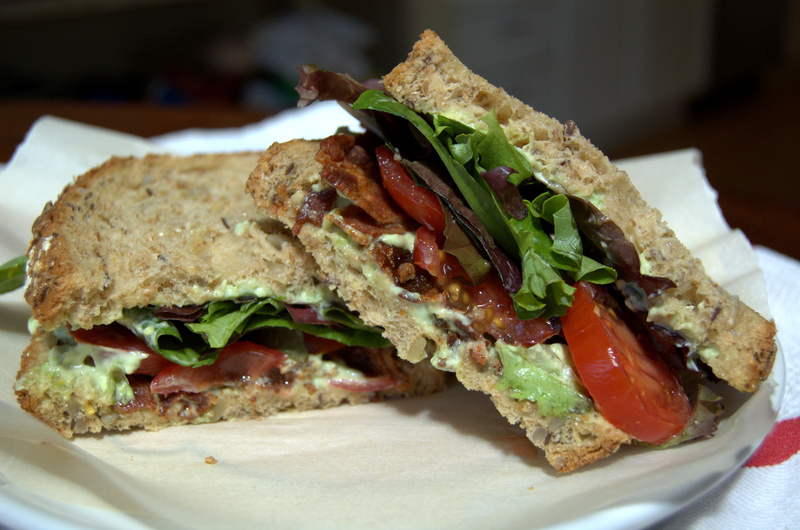 When I started writing the BLT recipe, I thought it would be quick and easy, to appease all bacon-loving home cooks (which really should be everyone, barring religious objections). But then I realized there were so many little tricks to make it better that I wanted readers to understand. Like, if you toast the bread for too long it gets brittle and competes with the texture of the bacon, and also rips up the roof of your mouth after two bites. The bread should really only be slightly toasted – verging on golden brown around the edges but still soft in the middle. And the tomatoes should be thinly sliced so the juice doesn’t overpower the other flavors and make the bread soggy. Oh, and it helps to salt the tomatoes directly (and minimally) to bring out maximum sweetness. As I wrote, I realized the key to a great BLT, as with all memorable meals, is the balance of flavors and textures – sweet tomatoes, crunchy, salty bacon, firm bread, crisp lettuce, and tangy mayonnaise – and the little tricks involved in finding that perfect balance. I originally thought this sandwich recipe would be a home cook’s homerun. Turns out, it actually bridges the two warring sides of my personality. 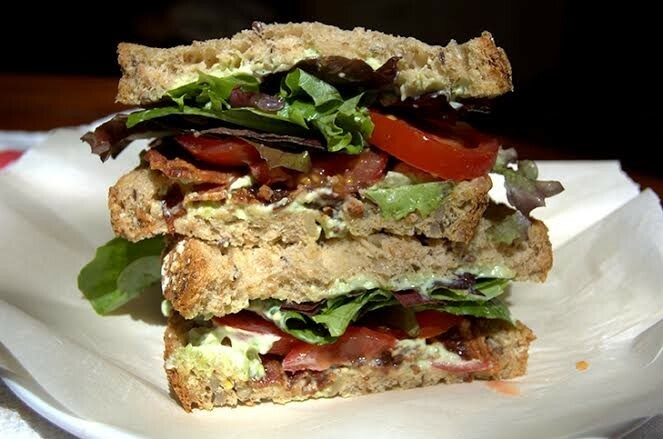 It’s a simple recipe boosted by a few nuanced thoughts, to appease the home cook looking for a quick fix and the restaurant cook hoping to offer you the best BLT you’ve ever had. Makes 2 sandwiches. This is my version of an out-of-this-world BLT. Purists may frown at the avocado-cilantro mayonnaise but there isn’t enough of it to un-BLT the sandwich. Of course, if you are one of the 20% of humankind that thinks cilantro tastes like soap, by all means, leave it out. It will taste (practically) as good. 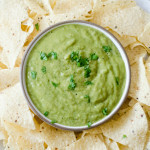 In a small bowl, mash the avocado into small chunks. Add the lime juice, salt and cilantro and mix to combine. Fold in the mayonnaise, stirring until combined. Sandwich the bacon slices between two sheets of paper towel on a large plate. Microwave for 5 to 5 ½ minutes, depending on the strength of your microwave, until the bacon is browned and crisp. Toast the bread lightly in a toaster, until it just begins to brown but is still fairly soft. Wash the tomato and cut four slices, ¼ – inch thick each. Reserve the rest of the tomato for another use. Smear each slice of bread with ¼ of the avocado mayonnaise. Layer each with half of the bacon, lettuce, and tomato. Sprinkle the tomato slices lightly with salt and pepper. Top with the other slice of bread, slice each sandwich in half, and serve.